"There is no crime for those who have Christ," claimed a fifth-century zealot, neatly expressing the belief of religious extremists that righteous zeal for God trumps worldly law. 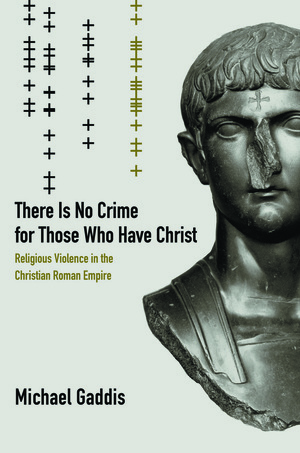 This book provides an in-depth and penetrating look at religious violence and the attitudes that drove it in the Christian Roman Empire of the fourth and fifth centuries, a unique period shaped by the marriage of Christian ideology and Roman imperial power. Drawing together materials spanning a wide chronological and geographical range, Gaddis asks what religious conflict meant to those involved, both perpetrators and victims, and how violence was experienced, represented, justified, or contested. His innovative analysis reveals how various groups employed the language of religious violence to construct their own identities, to undermine the legitimacy of their rivals, and to advance themselves in the competitive and high-stakes process of Christianizing the Roman Empire. Gaddis pursues case studies and themes including martyrdom and persecution, the Donatist controversy and other sectarian conflicts, zealous monks' assaults on pagan temples, the tyrannical behavior of powerful bishops, and the intrigues of church councils. In addition to illuminating a core issue of late antiquity, this book also sheds light on thematic and comparative dimensions of religious violence in other times, including our own. Michael Gaddis is Associate Professor of History at the Maxwell School of Citizenship and Public Affairs at Syracuse University.